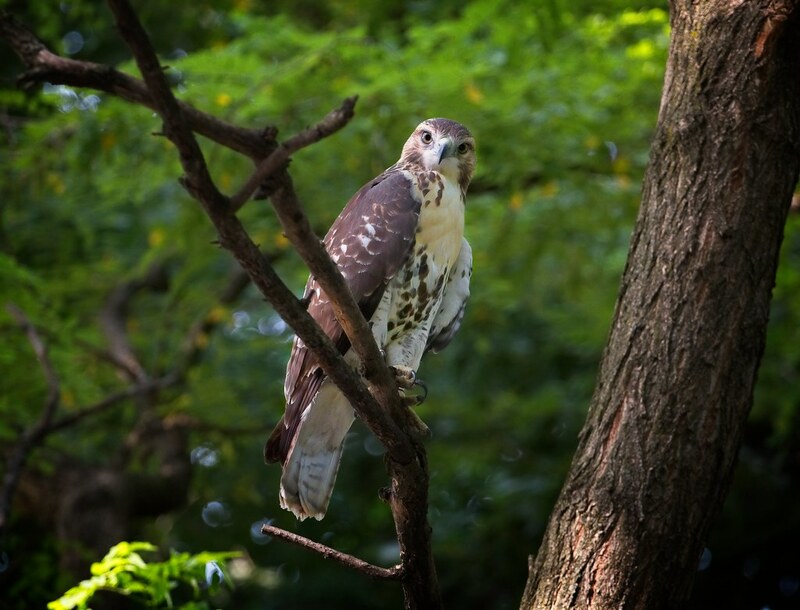 This week's Tompkins Square hawk update isn't too exciting, but that's to be expected for late July/early August when the weather is hot and humid, and the hawks begin to drift further from the park. 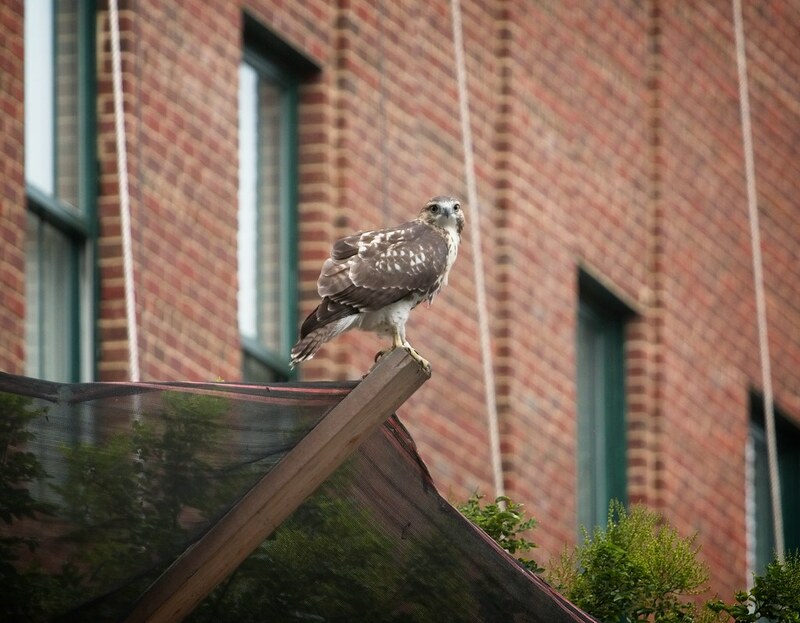 Both fledglings (Ten and Flatbush) are both still around, but I haven't been able to see if they are hunting and feeding themselves. Christo still seems to be providing for them, so they are not yet ready to go off on their own. 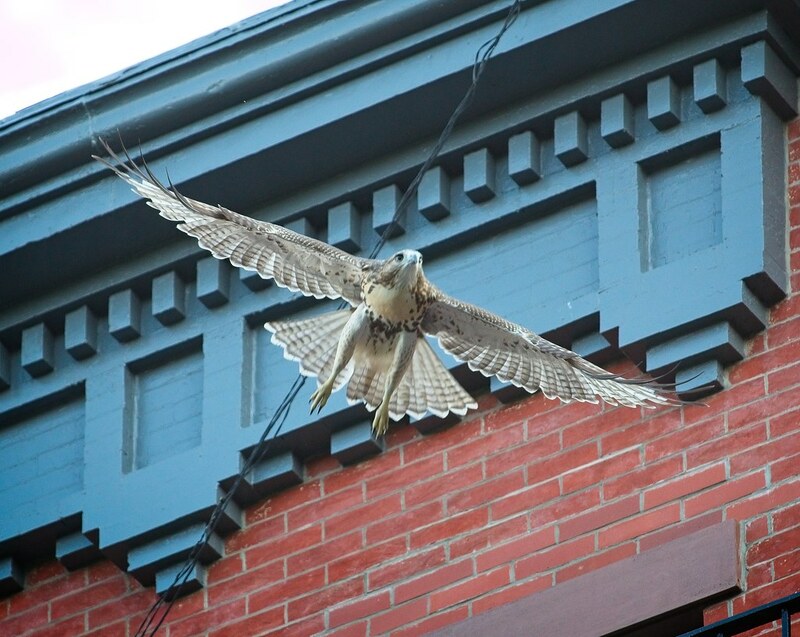 The photos below were taken over the last several days. 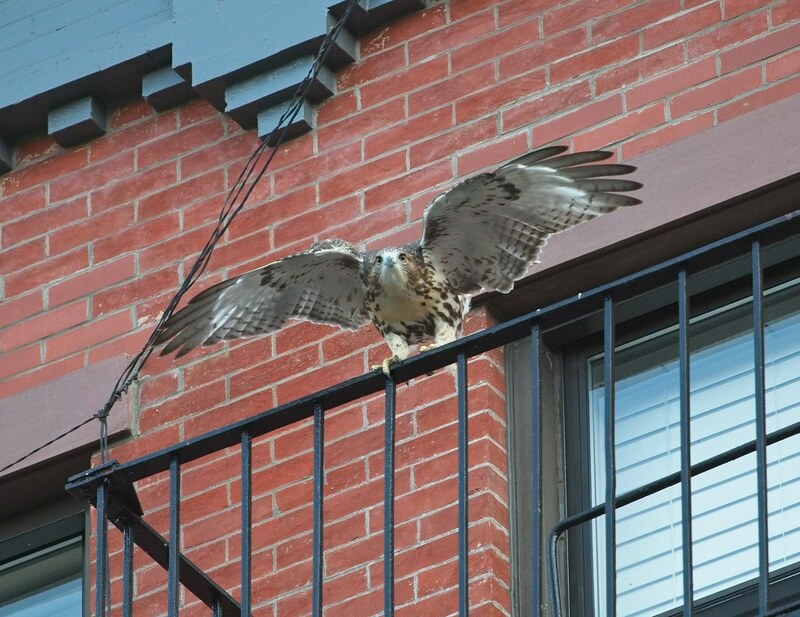 Ten explores a fire escape along 7th Street, south of the park. 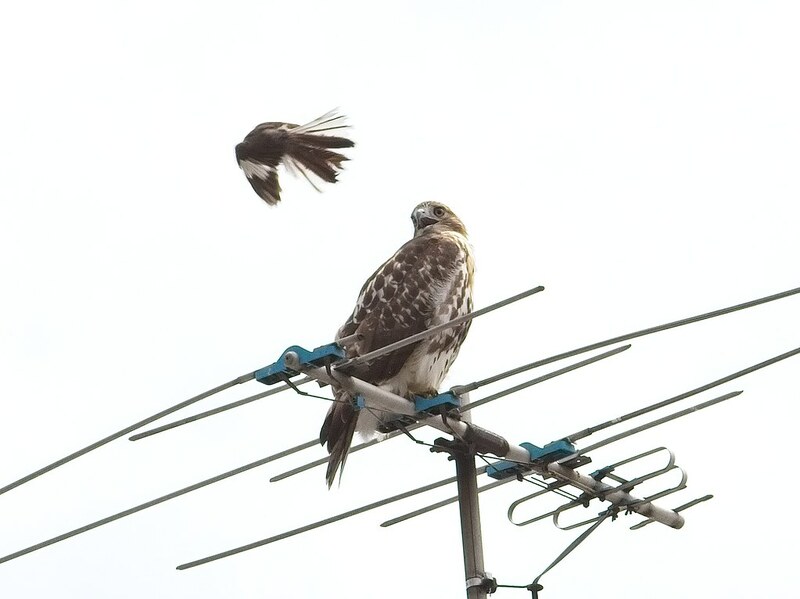 Late on a dreary afternoon, she was mobbed by a mockingbird while perched on an antenna on the same block of 7th Street. 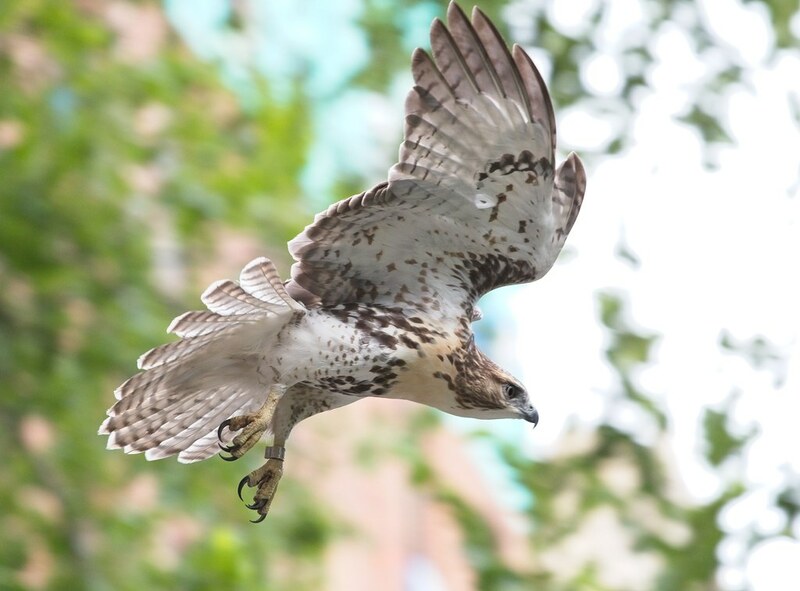 Urban Hawks has some nice photos and video of her that same afternoon. 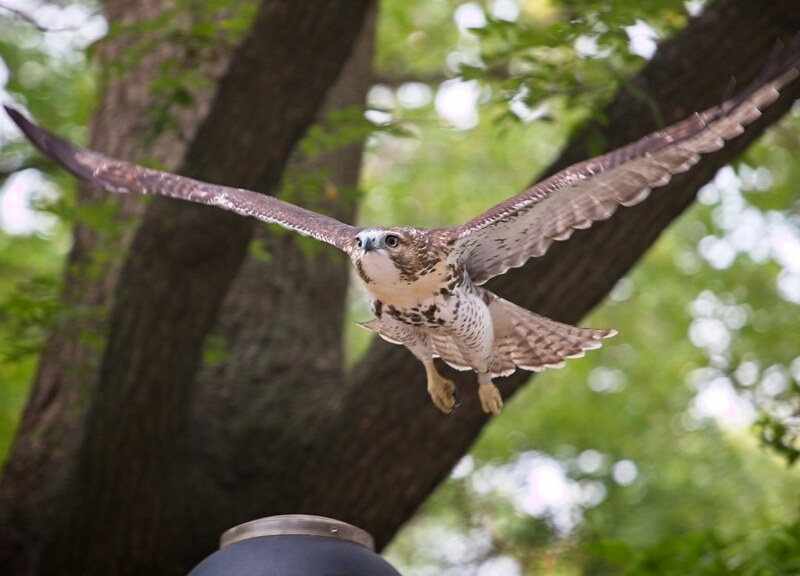 In the end, the mockingbird succeeded in bullying Ten off her perch and chased her back into the park. 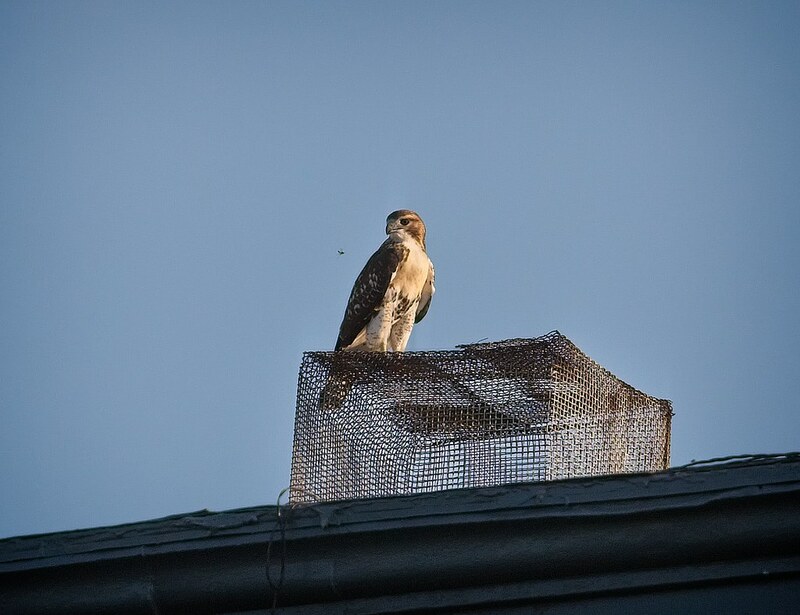 On a sunnier afternoon, Flatbush perched on a chimney on 7th Street and regarded a flying insect. The following images are all of Flatbush. 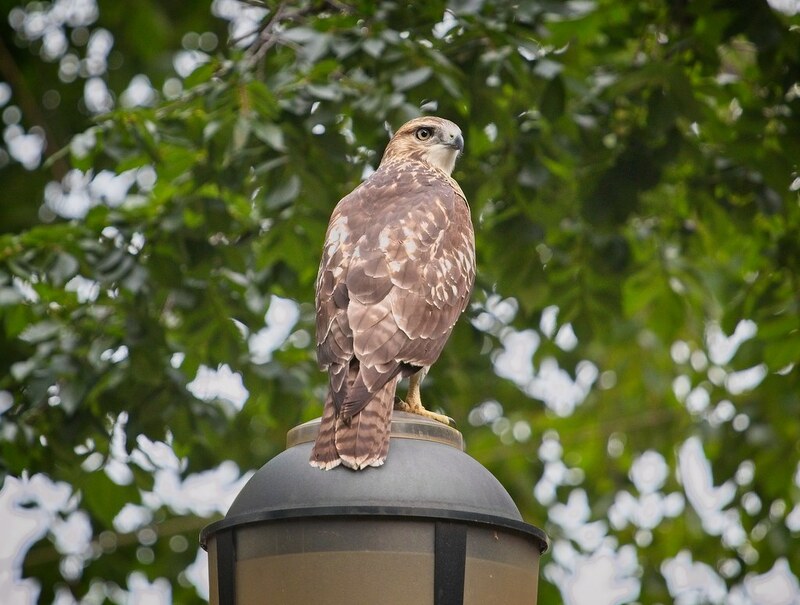 Note the band on his left leg. This is the easiest way to identify him. 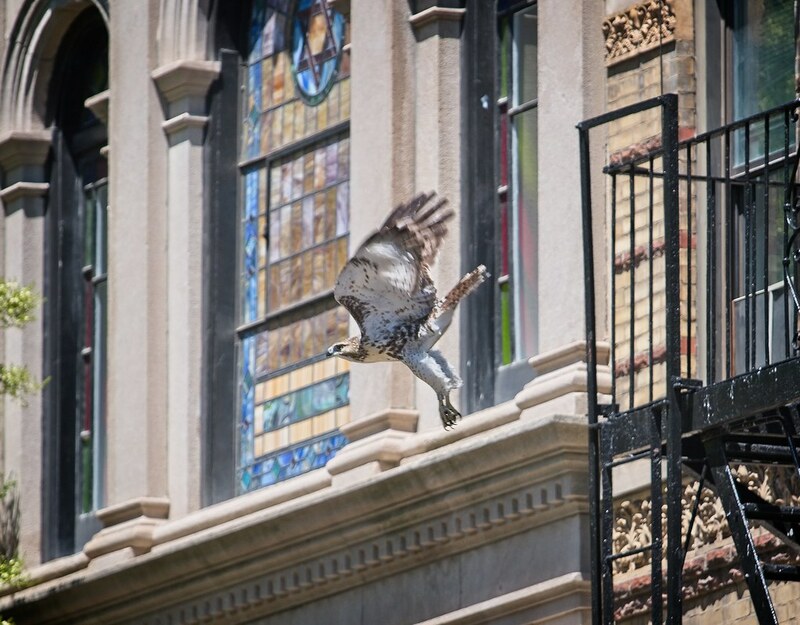 Exploring the scaffolding at the Christodora House on Avenue B and 9th Street. Paying a visit to the Meserich Synagogue on 6th Street, just east of First Avenue, this last Sunday. 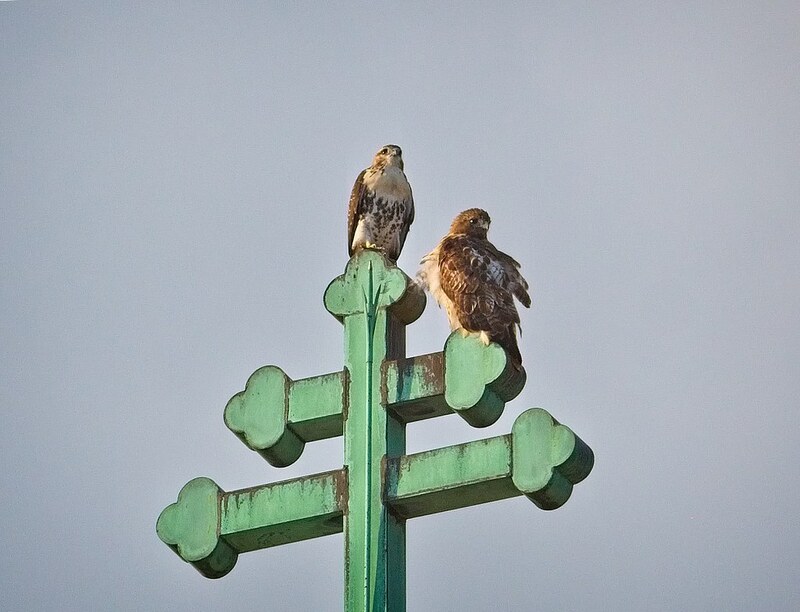 Monday evening, Flatbush surprised me by appearing alongside Dora on the cross of St Nicholas of Myra Orthodox Church on Avenue A and 10th Street (in the photo below, Flatbush is on top, Dora is on the right). 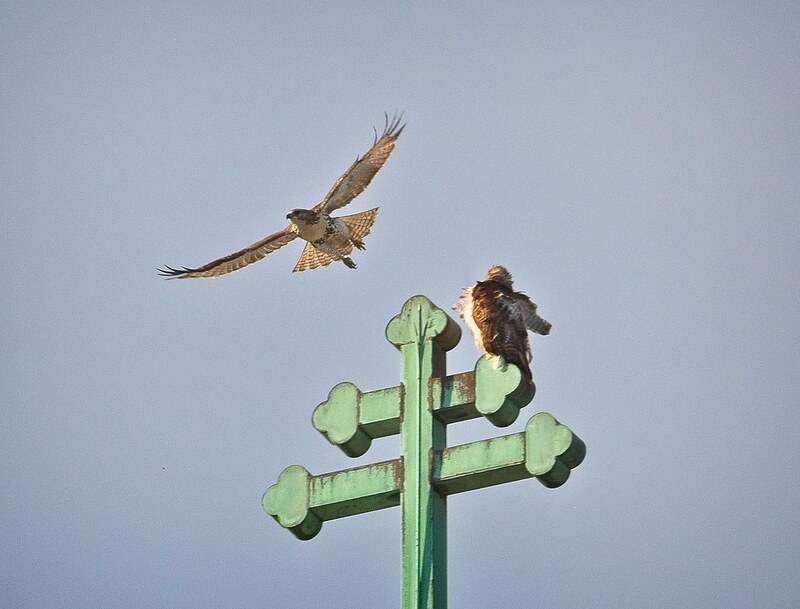 This is the first time I've seen him on a church cross, and is the highest perch I've seen him achieve so far. 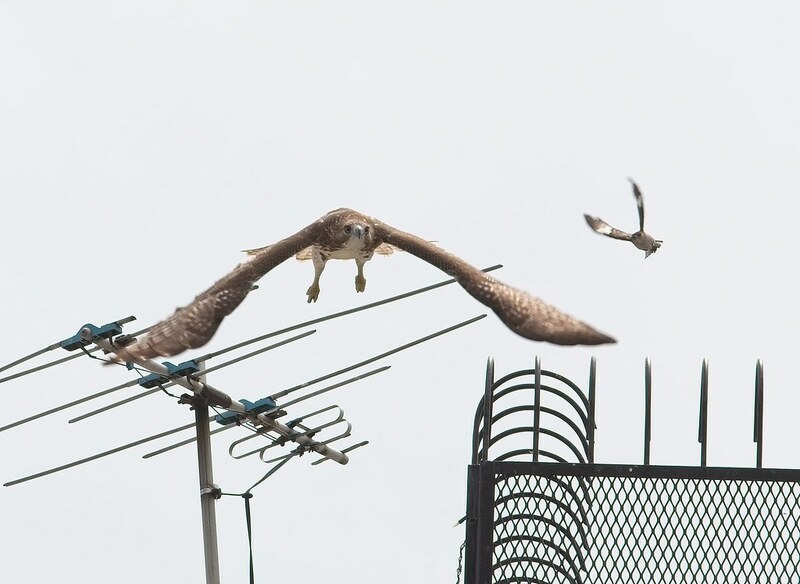 After watching Dora preen for a few minutes, Flatbush took off south and disappeared over the rooftops on 9th Street.